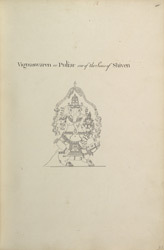 Pen and ink drawing of Ganesha with his consort, from the Minakshi Sundareshvara Temple, Madurai, from an 'Album of 51 drawings (57 folios) of buildings, sculpture and paintings in the temple and choultry of Tirumala Nayyak at Madura. c.1801-05', by an anonymous artist working in the South India/Madurai style, c. 1801-1805. Each picture is inscribed with a title and a number in ink. The Minakshi Sundareshvara Temple complex contains two main shrines; one dedicated to Shiva and one to his consort Minakshi, an ancient local divinity. Each shrine is set within its own walled complex containing several subsidiary shrines, mandapams (assembly halls) and artificial pools. The construction of this temple-town was made possible by the wealth and power of Tirumala Nayak (1623-1659). He was the most prolific builder of a long line of Nayaka kings, a dynasty who ruled a large portion of Tamil country in the 16th and 17th centuries. This drawing is a detail from one of the mandapams with columns that are elaborately carved with figures of Shiva in his various manifestations, yalis (fantastic lion-like beasts), other Hindu deities, as well as foliate decoration. Ganesha is the elephant-headed, pot-bellied god of wisdom and remover of obstacles and he is therefore revered at the beginning of any important undertaking. He is a son of Parvati, Shiva's consort. In this drawing he is represented seated on his mount, the rat, with his consort.